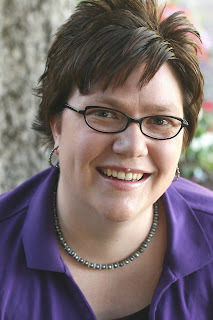 Elana Johnson is a teacher, a way cool wife and mother, and a newly published author. I have been anticipating her book, Possession, for quite a while now. I met her for the first time last Saturday at the Utah Festival of Books held on BYU campus. She spoke for a few minutes, then signed books. My book arrived a couple days later, on Monday, so I was book-less at the time of the Festival. I hear-tell that there were a few copies for sale that day, but every clerk I asked had no idea what I was talking about! 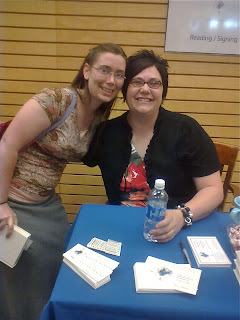 Oh well, she signed a bookplate for me that day and today, at a Barnes and Noble signing, I got to see her again and get my book signed. PATIENCE: Publishing takes an insane amount of time. You need to figure out what you are doing then find an agent and a publisher. You need to have patience with yourself while you are discovering your talent and being creative. You will get better as you write, as you develop your talent. PERSEVERANCE: Many people will tell you "no" or that you're not good enough. Don't let people tell you that. Elana told us that the first two books she tried to get published didn't go anywhere. For the third book, Possession, she sent out 189 query letters. All but one said no. It's easy to get discouraged. But you can do it. PRODUCT: You need to write something that someone wants to read. Elana mentioned having been inspired by a show about Tom Brady. To become what he is, he had to work really hard. If you work hard you will make something great, you will produce a good product. LUCK: The dystopian wave hit with the publishing of The Hunger Games. 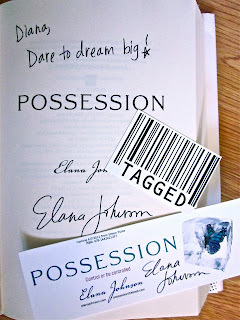 This helped Elana's book Possession to get picked up. This was very lucky timing, but if she hadn't been patient, persevered, or made a good procuct, she wouldn't have had that luck. You make your own luck. Today, at the Barnes and Noble in Orem, Elana spoke again and had another book signing (this is the launch week of her book after all!) She spoke about her writing and specifically about Possession. During 2008, she said that she probably wrote ten books. Then the OCD Elana came out because what should you do with so many manuscripts? Get published. So how do you get published? She said that she was like a pit bull about it, she wouldn't let go (her husband said that this is why he married her, why he needs her, because she gets things done and doesn't give up). she learned all she could about the subject. She sent out so many query letters for the first book she wrote and received so many rejections in return. After querying another book with no success either, she chose to try Possession, called Control Issues at the time. She began querying it in December, 2008, just after Hunger Games came out. Elana received so many "no's" for her Possession manuscript, but she knew it was The One. Because she didn't give up, eight months later she got an agent, then a publisher shortly thereafter. Now, eight months after that, Possession is for sale. Elana explained that post apocalyptic/dystopian is such a big genre now. She said that she likes to write angsty books because they are emotionally intense. The first dystopian book she ever read was Uglies by Scott Westerfeld. She told us that she had never even read The Giver by Lois Lowry (neither have I! It's on The List though) until her agent told her that she should. She told us that she only reads for enjoyment. After reading Uglies, she said that she wanted to write something like that. She had to look up what dystopian was. Concerning the dystopian genre, she said that the possibilities are endless and that it's a great way to explore so many different issues and realize that our choices have consequences beyond ourselves. 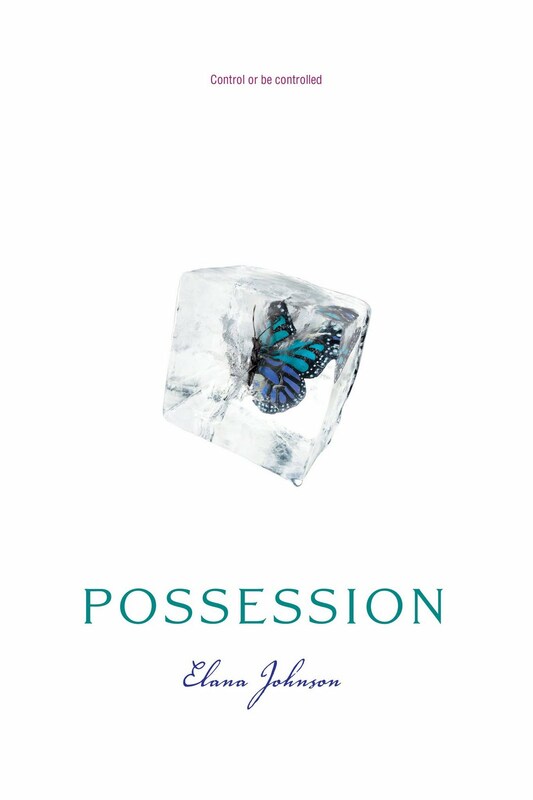 In her book Possession, no one has choices, the government tells the people what to do. Choice is a big theme in the book. She has been asked what she hopes readers will get out of the book. She simply replies that she hopes they will feel that it was time well spent. She said that when she reads Possession, it causes her to look at her life and see if the choices she makes really go along with what she believes, and that that can go for anybody, no matter what their beliefs are. Q: Why did you start the main character in rebellion mode whereas other dystopian books begin with the main character accepting their society and then rebelling along the course of the story? A: The main character is very angry. She has always known, since a young age, that she didn't want others to tell her what to do. She has never been okay with the society. Q: What do you use for writing and editing? A: I use Word. I don't do outlines or note cards. There is a joy in discovery writing. I don't write in order. I save the scenes then put them together. I print them out and scratch on them with a pen, then put them back onto the computer. Q: Is Possession a stand alone novel or will there be a sequel? A: It was written as a stand alone -please do not say that it ends with a cliff hanger (I think she said what to call it, but I missed it). now it is part of a proposed trilogy, but not directly. The second book, Fugitive (next year I think), is in the same world. There are two new characters in a different city but some of the same characters will appear in the book. Q: Any problems with the editing process? A: There was no problem with editing. My editor would put hearts next to her comments so I knew that she loved the book. Changing the title was tough. The marketing people thought that it (Control Issues) was too middle grade. After a while I realized they were right. Q: What's your favorite part about writing? A: The drafting. it's such a creative accomplishment. There's nothing like sitting down at a blank document. Q: Who is your favorite author right now? As I mentioned, I received my copy of Possession on Monday, the day before it was officially released -I read it in two nights. The story is so intriguing and fast paced. The writing is also right-on and consistent with how you would imagine an angsty, rebellious 15-16-year-old girl would speak and think (oh, and just FYI, I think there were only two bad words [the A one and the S one -you can laugh at me if you want for not spelling them out]). There is also a love triangle and some kissing and closeness, but it's not all mushy-gushy and sensual (sorry to disappoint anyone, but I don't like it when things get all, you know, hot and heavy. I think it takes away from the story, the whole reason I picked the book up in the first place. If I wanted that mushy stuff I would just read a pulp romance or something. Blehk. I don't think so). Concerning the ending, I like how Publisher's Weekly put it, "...a dark twist ending that maintains the faintest glimmer of hope.” Yes! That's why I'm so excited for the sequel next year!